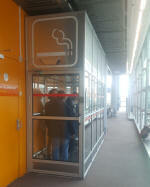 Smoking is permitted in designated areas outside the terminals and reports suggest there are a few in the terminal also. 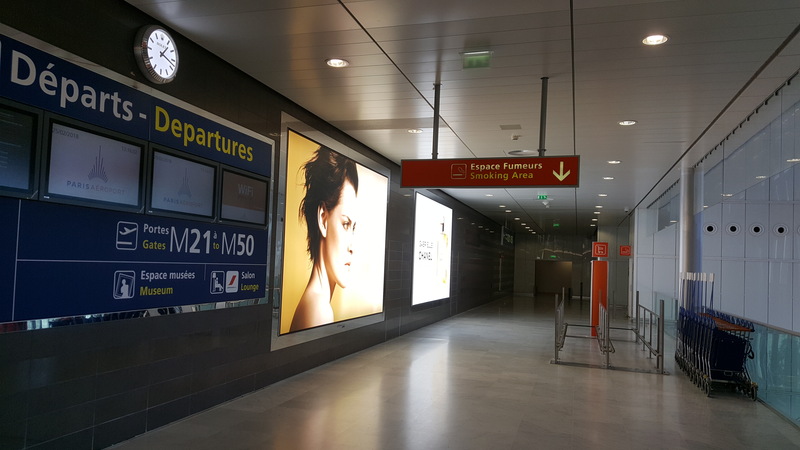 Update from Glenn B, April 2019: Paris CDG Airport Terminal 1 After passport control but before security check Smoking is at Level 10. Take elevators located by Laduree and Hermes. Also the Lounges of icare/Star alliance (level 10) and Qatar Lounge (Level 11) have their own separate open air smoking facilities. 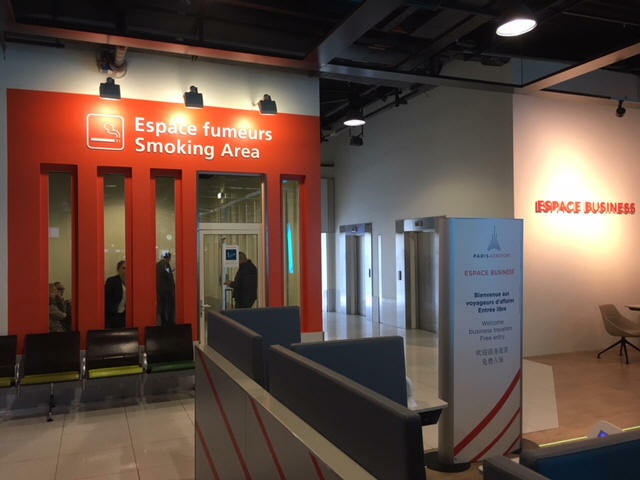 Smoking rooms (there are 2 in the same area but only one has been open during my last trips) are located on level 10 near the 1st and Business Star Alliance lounges. 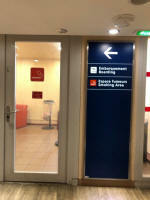 I would like to inform you that there is also a smoking area after security located next to the Icare lounge. Take the lift up to floor 10 and it is there. Feedback from Jean-Marc C. on the 4th December 2017. 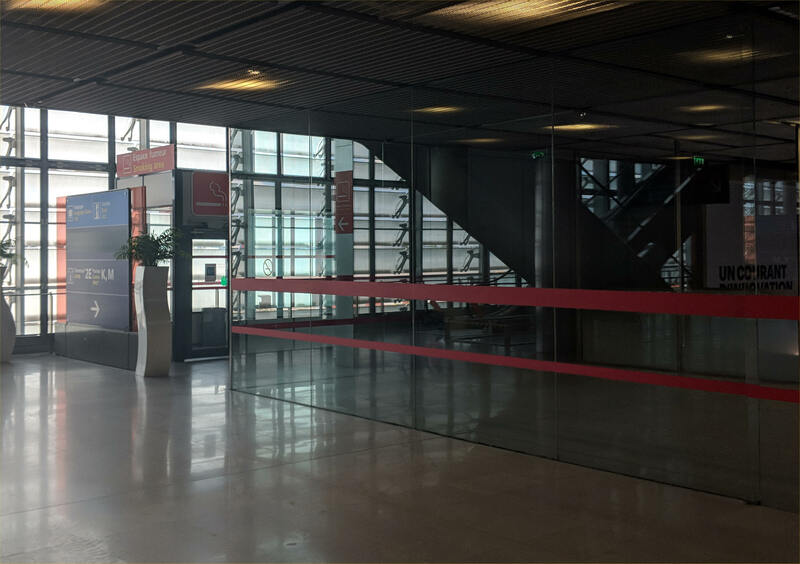 Update from Troy S. on the 11th Jan 2019: PARIS CDG 2A: After Gate A48, upstairs by Fauchon / El Al Lounge (inside glass box). Also upstairs between Hermes & Prada by CP/AA/Emirates/Etihad Lounges (outside garden smoking area) HONG KONG T1: By W1 Transfer Desk, Gates 1-4 No smoking area (10 minute walk to closest between Gates 25/27), Gates 15-19 No smoking area (10-minute walk to closest between Gates 25/27), Gates 20-36 smoking area downstairs between Gates 25/27, downstairs by VIP Lounge between gates 29/31, Gates 40-50 between gates 41/43. Gate concourse 60-71 at Gates 61 & 64. Satellite concourse Gates 501-510 behind elevators near Gate 510 toward Observation Deck. I found 3 separate airside smoking areas but non are clearly signposted. 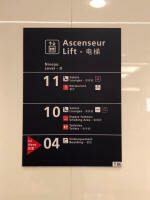 Outside already noted by someone is next to the main lounges Take the lift opposite main Duty Free (tobacco / alcohol). At the top it’s signposted. Games area near McDonalds. Go down stairs into games area for 2 smoking cabins (this is towards C gates from centre). Smoking area near McDonald’s, map below. Smoking area near the gate 58. ground level, outside. 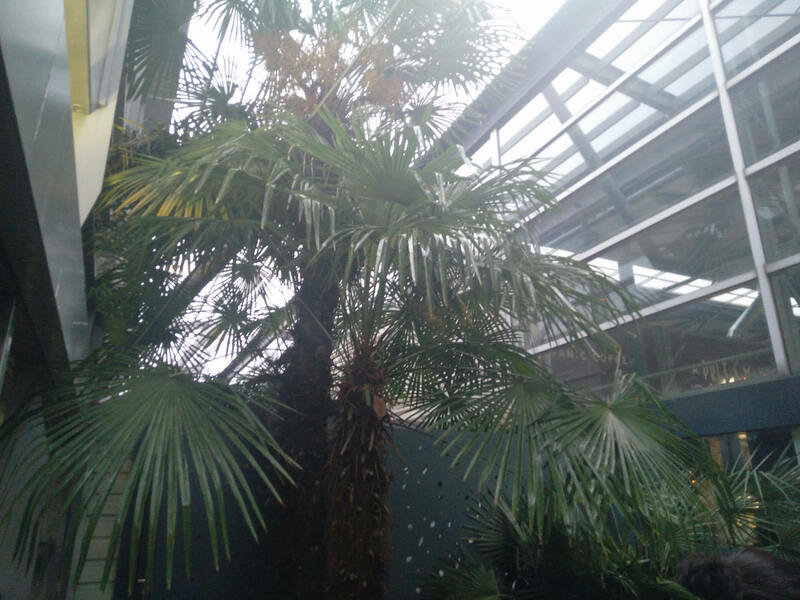 Update from Liisa A. on the 4th April 2019. D62/63 first level. Large Smokers area. Verified 17th April 2018. Feedback from Tom C.
A secured smoking area is located downstairs near gate 58. An open-space smoking area is located on the ground-floor shortly before the lounge and passport controls. 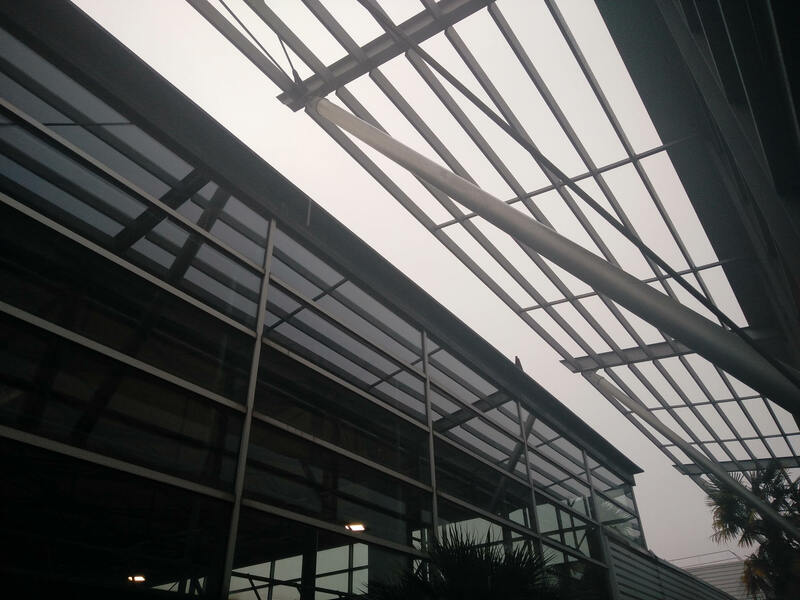 The area is actually located on the aircraft parking area, with an open roof. Feedback from Frederic on the 8th August 2017. 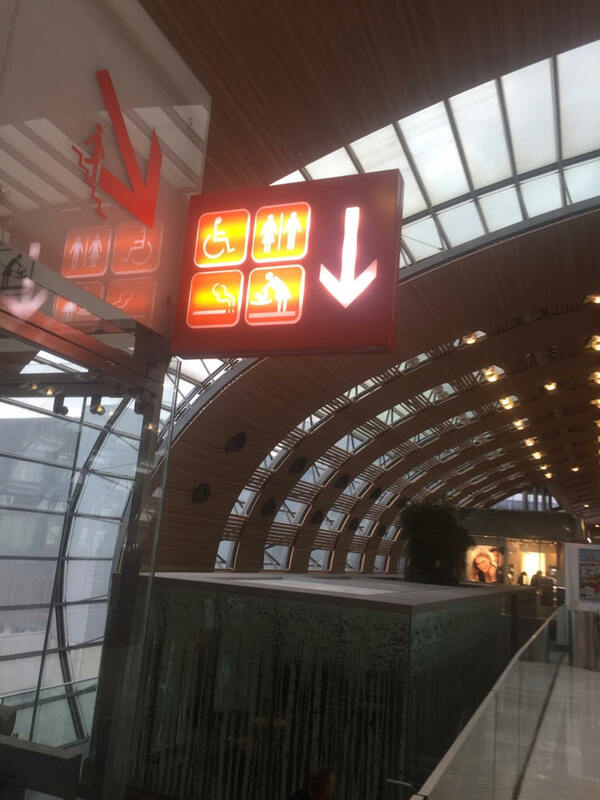 Update from Troy S. on the 11th Jan 2019: K Gates - By Relay Newsstand then downstairs across from K39 / Downstairs between K30-K31 / Downstairs across from K47 / By K45 PARIS CDG 2E: In Baggage Claim by belt 31 TOKYO HANEDA Arrivals: No smoking area until after customs. Smoking room to left of cash exchange & ATMs TOKYO HANEDA Departures: After check-in counters before immigration. 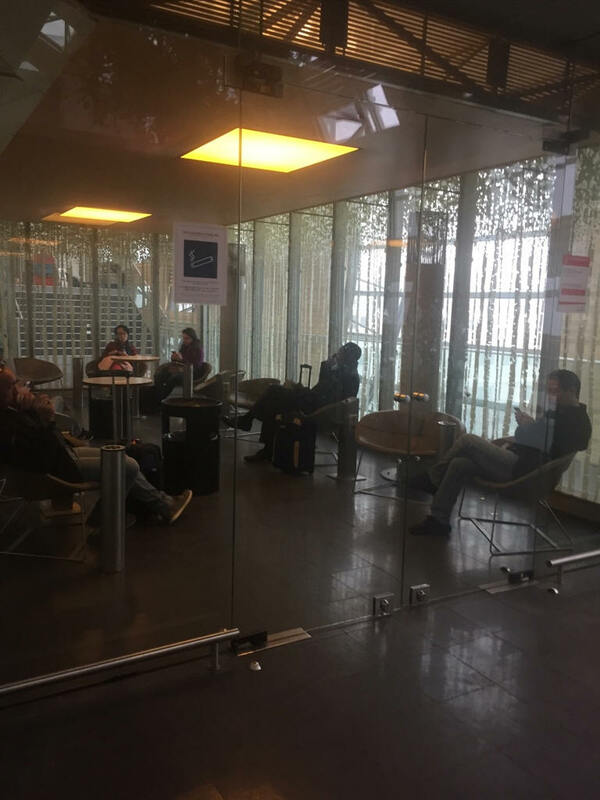 After immigration and security: several smoking rooms throughout gate areas and in Sakura Lounge PARIS ORLYW: By Gate 10P to the left of the toilets in the M-P gate annex. 7 minute walk to gate 10A. 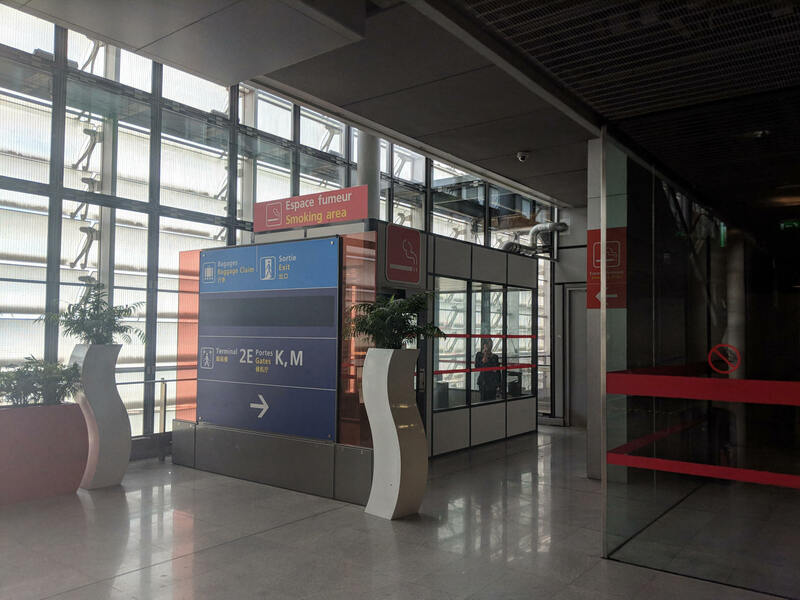 Update 10th August 2018 from Lee S.: I found new smoking area near AF service counter in pier L. It is located behind the line for security of pier L. It will be good for those who use free CDG lounge nearby. Photos below. 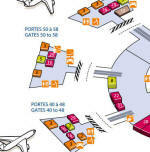 Located behind the line for security of pier L.
Next to gates F21 and F46 are two places to smoke after security. Update from Mark on the 14th Aug 18. Smoking room is to the right at the bottom of the stairs / escalators. At gate area F47-56: smoking room is downstairs across from the restrooms. Smoking area in main Waiting Area, just at top of stairs after coming through security, on back wall by Espace Business. Update from Sean C. on the 2nd May 2018. Photo below. Update from Estelle D. on the 3rd Dec 2017: This is to confirm there is a smoking area after the security in front of gate 8. It is a huge area compared to many other airports and open. See pictures. 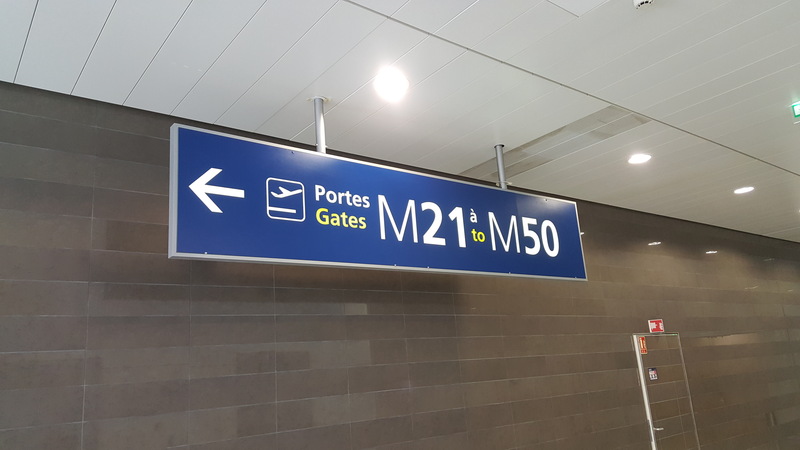 Between Gates 29 and 31 and at Gate 33. 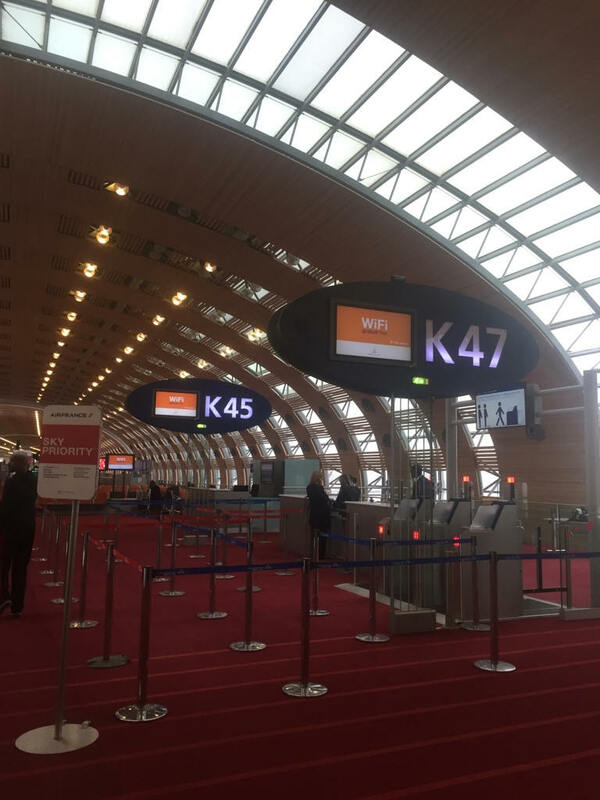 Gate - K45, provided by Chris G. 17th Feb 2017. We believe this is now closed. Gate 8, smoking area, photos provided by Estelle D.
Smoking areas: Main one at the entrance at Terminal 3E gates M have a large 20+ smoking lounge. The others are T gate 31 and 35 are smaller. 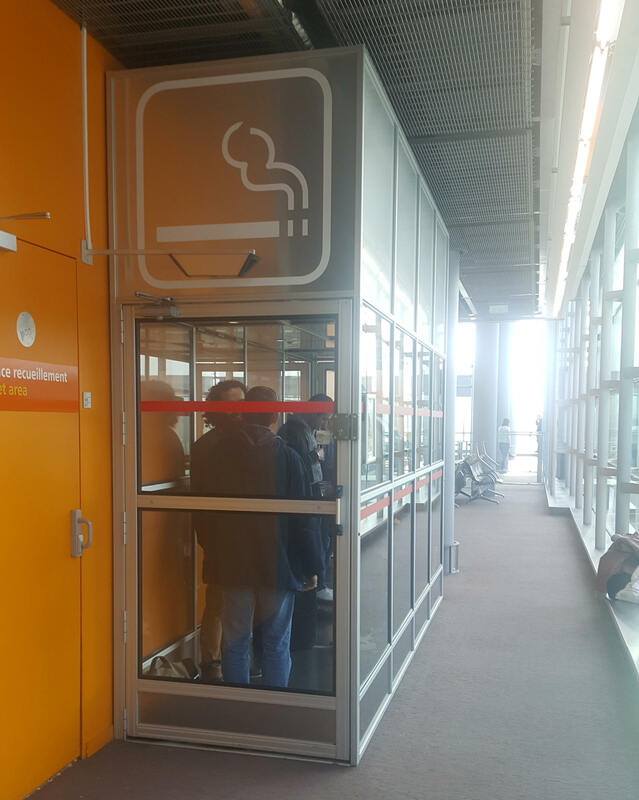 Update from Linda for connecting flights 30th December 2016: Smoking area just before entering L gates security, when making connecting flight. 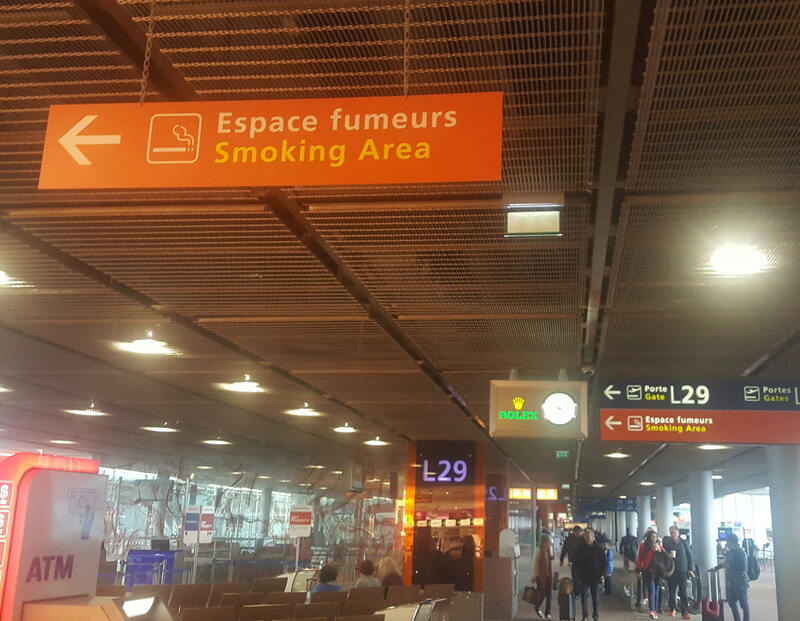 According to the law, CDG is a smoke-free airport. However, smoking is permitted in designated areas located airside (after security). This has been confirmed by Anita on the 4th November 2016.